With numerous Android phones hitting the smartphone market almost every week, it becomes very difficult for the users to choose the best Android phone for themselves. A user generally gets confused when it comes to making a choice from such a wide range of Android Smartphones. In addition, due to a cut throat competition in the market many big smartphone manufacturers are launching their products at very affordable prices that makes it even more difficult for the users to select the best Android phone for themselves. However, here Google comes to your rescue. 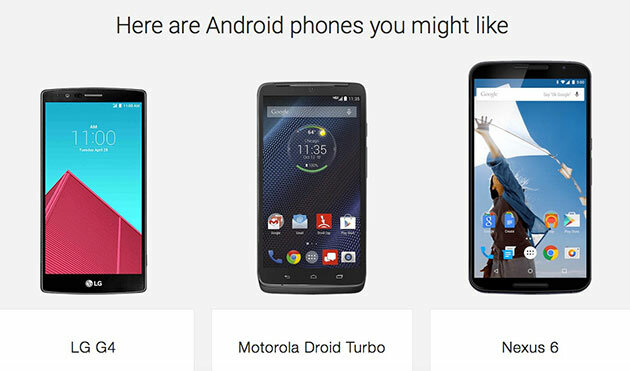 The search giant Google has recently launched a new tool namely “Which Phone” that offers recommendations to the users bases on their preferences. 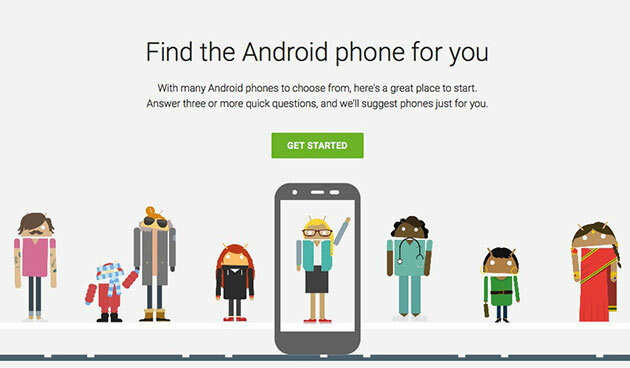 The Google’s find the Android Phone for you is a handy tool that basically works by asking few general questions from the users. Firstly, the users will have to simply choose three activities that they usually do while making use of their Android smartphone. These activities include 12 options namely gaming, talking, social media, texting and instant messaging, watching videos, being on the go, web browsing, being productive, expressing my style, staying fit, listening to music and taking photos. On the basis of the user’s selection, they will be questioned about how frequently you use your phone for that particular activity. The users will have to select at least three options in order to proceed further. 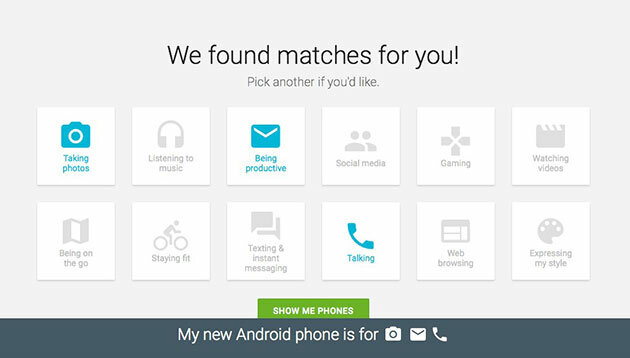 Now, simply click on the “Show Me Phones” icon in order to view the list of recommended Android Phones generated by the Google’s find the Android Phone for you tool and will also offer links to buy them. Once the results get displayed, the user can filter the smartphone results on the basis of their sizes, carriers, latest phones and prices. If the results remain unfiltered, the tool will display flagship handsets such as HTC One M9, LG G4, Galaxy S6/ Galaxy S6 Edge and many more. Every handset that gets displayed as results have reasons for their selections and their best attributes like balanced speed and endurance or social multi tasker. Although the fact that how many brands are included in the Google’s Database is unknown but still this handy tool will lead the users to the right path. The tool has got a user-friendly interface and is neatly designed that enables the users to easily make use of this tool without facing any hassles. The Google’s Which Phone tool is a quite handy tool that aims to help the users in choosing the best Android smartphone that can best suit their requirements in an easy and quick manner. It also explains everything in a clear manner that why the device will suit the requirements of the user. So, if you are planning to buy a new Android Smartphone for yourself and you are facing some difficulties in choosing the right phone for yourself, you need not worry any longer. Just get started with this handy tool introduced by Google and choose the best Android Phone as per your requirements.